How do you end all excuses? It’s very simple – don’t accept any of them! Let me explain. There is method to my madness. In my early years of teaching, when a student forgot to bring in their planner, permission form, or didn’t do their homework, I listened to their excuses. Some of their excuses were accompanied by a parent note. And some excuses were more elaborate than others. Over the years, I realized that I was training my students to become great excuse makers. They weren’t learning how to take responsibility for their actions. I changed all that by not accepting their excuses. I met my students at the classroom door. This question catches students off guard. They’ve been working on using their excuse with you because they think they’re going to get into trouble with you. (Instead, here’s an opportunity to teach and develop problem solving with the students. If I see a pattern in the number of students not having their planners complete, we discuss as a class some solutions to the problem. Doing so may simply be a matter of putting the planner on the kitchen table every night before going to bed. Or asking a parent to sign it first thing in the morning. Your class will come up with many other innovative solutions). I used this strategy for other situations. One student forgot his lunch. I asked him what he planned to do about it. He said that he was going to call his mother to bring his lunch for him. Instead, I asked if there was another solution. He looked at me and said no. He always called his mother to bail him out. That was his one tried and true solution to most of his problems. I asked the class to help and brainstorm ideas. One student said they had an apple they could give him. Another student had half a sandwich to share. Another one had a cookie. The exercise helped to make the student more responsible for his actions. It was also a class building exercise. The student felt safe and secure asking help from fellow students. And the class felt great for helping out a student in need. It’s just a little step in showing students how to be responsible and caring future citizens. It’s baby steps, trust, matching task to ability, praise and reinforcement. 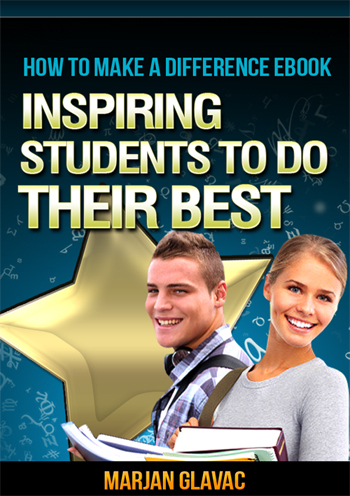 *** How To Make A Difference: Inspiring Students To Do Their Best is a 222 page resource with ideas and strategies on how to overcome obstacles, how to motivate your class and how to get yourself motivated when nothing seems to help.